1. In a small pot combine sugar, corn syrup and water. Place candy thermometer in to the post and heat mixture to 240°. 2. While syrup is heating, place egg whites, salt, cream of tartar, vanilla, and liquid smoke into a stand mixer and whip until medium-stiff peaks form. 3. When syrup reaches its temperature, remove from heat and very slowly drizzle into egg whites. Turn stand mixer on and whip until very shiny, stiff and sticky. Put fluff into pastry bag and refrigerate. 2. Place chocolate in double boiler, attach candy thermometer and heat until just barely melted. Chocolate should not go above 95°. 3. While chocolate is coming to temperature, add cream and milk to a sauce pan and heat over medium heat until simmering. 4. Add eggs and sugar to a mixing bowl and beat with a hand mixer until pale yellow and fluffy. 5. Carefully add (temper) cream mix into egg mix, then add (temper) chocolate to the egg and cream mixture. Strain through a fine mesh strainer into a clean bowl. 6. Portion into mason jars (filling about 1/3 of the jar) and bake in a water bath for 45 minutes. 7. When done cooking, remove from water bath and let cool to room temperature, then place in the refrigerator until ready to use. 1. Put crackers in a mixing bowl and coarsely break into pea size pieces. 2. Mix in milk powder, sugar, and salt. Add melted butter and toss to coat evenly. Put on sheet pan lined with parchment and bake at 275° for 20 minutes, stirring the mixture half way through the cooking time. 3. Remove from the oven and cool completely before use. 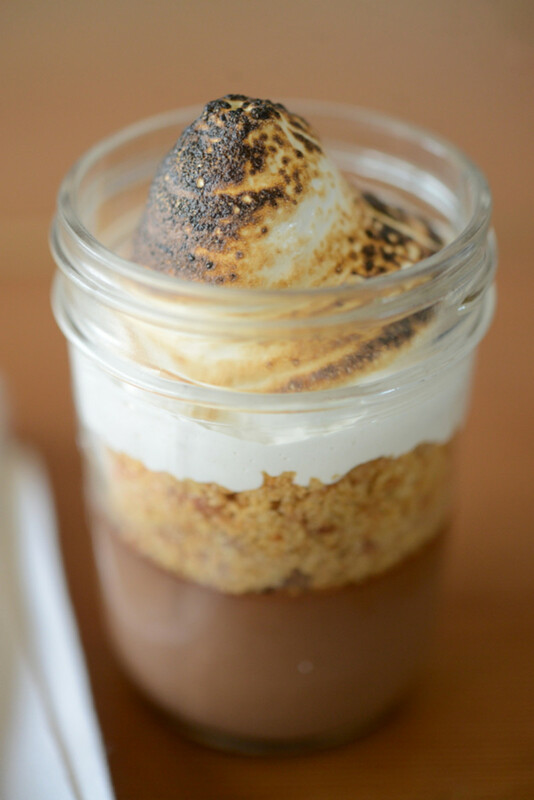 To finish the dessert, stack equal amounts graham cracker crumble and marshmallow fluff on top of the chocolate budino. Lightly torch the top of the marshmallow fluff and serve immediately.